Kids are sure to have this delicious corn and cheese toast. Serve this easy to make recipe for breakfast or as an after school snack. Cooking Time : 8 to 10 mins. 1. Cut each slice into 2 lengthwise. Toast them and keep aside. 3. Add the maida and cook for 2 minutes, over a slow flame, till the maida turns golden in colour. 4. Add the milk and whisk till no lumps remain. 5. Cook for another 2 minutes, while stirring continuously till the mixture thickens. 6. Add the capsicum, herbs, cheese, mustard powder, corn and salt and mix well. 7. 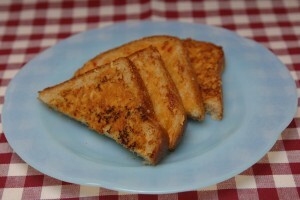 Spread the corn mixture on each toast piece and serve hot with Tabasco sauce.